Up next the CCC heads to Mt. Prospect for Melas CX Basin Racin’… which will also be known as the George Garner Memorial Cross Race after the late and great George Garner. Temps will drop dramatically over the weekend but thankfully there isn’t any snow in the forecast (fingers crossed). What’s up with so many people not wearing their helmets while riding their bikes around? Seriously, it’s a USAC rule there for your safety and just good common sense. Our USAC officials have informed us that going forward they will be handing out warnings, DQ’s, and even fines. So do everyone a favor and please wear your helmet at all times. A quick note on bib number placement. 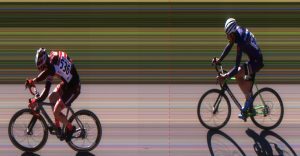 We know we and One2Go can sound like a broken record sometimes, but proper bib number placement really does make a difference in helping One2Go and the officials score each and every one of you each and every lap. In an effort to show you what One2Go is looking at, take a gander at the above images. In the 1st pic JP McCarthy’s (SRAM) number is perfectly placed on his side, with the bottom of the number aligned in the middle of the side panel of his jersey/skinsuit, while Walid Abu-Ghazaleh’s (Pony Shop) number is too high on his back. In the 2nd pic the numbers are again too high on the Junior riders’ backs and their long hair is on top of the numbers (get those long locks up in a pony tail, pun intended). We realize smaller riders may have space issues, but please do your best to have your numbers on your side, not the top of your back. You all have been doing a great job all season, but as temps drop and we start wearing more layers its important to keep those numbers visible so everyone is scored correctly, especially at the State Championship at Montrose where field sizes will be maxed out. Speaking of making it easier on people, or at least not harder, this is your friendly annual reminder that no one should be changing the course, in anyway, full stop. The only possible exception to this is when USAC officials or the race director may need to make changes for safety concerns or to extend/shorten lap times. We know lots of you are really excited to be at the races, cheering, being so close to the action, and maybe even offering handups. But every rider on course, from the early morning Masters, to the Juniors, to the Cat 1/2/3 men and Women, to the Cat 4/5’s is expecting to see the course each lap as it was laid out by the race director/designer and how they saw it while warming up, not by how an “enthusiastic” crowd wants to change it so riders will crash. We’re not pointing any fingers but simply asking everyone to maintain some respect for all riders out there racing and just enjoy the action from outside the tape. And if you see someone changing the course or getting too rowdy it is your responsibility to say something and intervene. This is your series just as much as it is ours. Find the race director or a USAC official if need be. Okay, thanks, yay bikes! Still upset about something? The Chicago Cuttin’ Crew (the other CCC) invite you to settle your beefs before the holidays in the Grudge Match category at Afterglow – A Cyclocross Race… which benefits the rad group over at West Town Bikes. Online pre-reg is now open and the event will again be held where it all started in Humboldt Park! Speaking of fundraisers tonight (Tuesday 11/15/16) is West Town Bikes’4th Annual Bikecitement Night! from 6pm – 8pm at Revolution Brewing (2323 N Milwaukee Ave). The board, staff, and youth come together to honor their partners and celebrate 13 years of nurturing Chicago’s future leaders and strengthening Chicago’s bike scene. Enjoy complimentary hors d’oeuvres and Revolution beer. In ‘way out in the future’ upcoming events news… from our friends down-ish state… the 3rd Edition of the Rough Road 100 is a spring classics styled race with 9 sectors of gravel and dirt. The route is 100K taking place on 4/8/2017 only about an hour southwest of Chicago and proves to be an early season test of your will. Come and give it a go, you won’t be disappointed. www.roughroad100.com. And finally… The 2016 Midwest Cyclocross Regional Championships are being held on Saturday, December 17 at Angell Park in Sun Prairie, WI. Angell Park is the former home of the Sun Prairie USGP of Cyclocross and is an elite-level course that hosted a UCI race for many years. The race provides the opportunity to compete against the best Midwest riders from Michigan to Chicago to North Dakota. The late December date provides the perfect opportunity to stay sharp for riders looking ahead to Nationals or for those who are looking to finish their season racing on a national-level course in the Midwest. More information about the event can be found at midwestcxregionals. Origin of the team colors explained. Hosted numerous great events, clinics, training races, and developed many many riders. SCW an absolute treasure to the Chicago area cycling scene. Thank you for a terrific weekend. The natural amphitheater raised the bar for the ChiCrossCup to a new high level. Just want to add: CCC alum Dani Arman won her first W123 race in Colorado last week at the Feedback Cup in Golden. 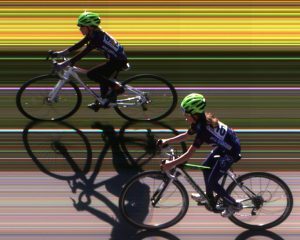 On a tight and bumpy technical course Dani was always in control, dropped the hammer with one to go and motored away from AG National Champion Kristin Weber for a solid win. Great result for her.